RUSH: Okay. So I’m doing the program yesterday, and they’re talking about Roy Moore, which I delayed even talking about until, when, the third hour? I had some brilliant stuff to say about Trump and the ChiComs and Xi Jinping and the North Koreans. And, by the way, talk about a major confirmation, hang on for that. So we get into the Roy Moore stuff, and I came across a little interesting factoid and I threw it out there, and it has sent the Drive-By Media into near conniption fits. I said, “Did you know that when all this stuff was happening before 1992, Roy Moore was a Democrat?” That’s it! That is it! And it’s amazing now, there are people who think that was a defense of Roy Moore and that I, El Rushbo, was trying to point out that the hypocrisy was that, since he was a Democrat, it had all happened when he was a Democrat and nobody cared about it when he was a Democrat, that somehow this is a defense of whatever he’s alleged to have done today. And it was just a throwaway line. It was a little interesting factoid. Listen. Grab audio sound bite number nine. This is CNN International last night. The co-host is John Vause speaking with Loyola Marymount University’s Global Policy Institute President, Michael Genovese — no relation to Kitty Genovese — about allegations about Judge Roy Moore during a discussion about continued conservative support for Moore. I defy anybody to find where I have even got anywhere near support or outright condemnation. I have handled this like I handle all of these things; I back off and wait to see what the truth is. I have my opinions about what is being done and how the reporting is being handled, but, for crying out loud, something about this hit a nerve with these people. I’ll tell you what it is, folks. I’m gonna tell you exactly what it is. Here’s the sound bite first. VAUSE: There’s still support for him on conservative talk radio, Rush Limbaugh in particular. He offered up another defense of Roy Moore, which was bizarre. 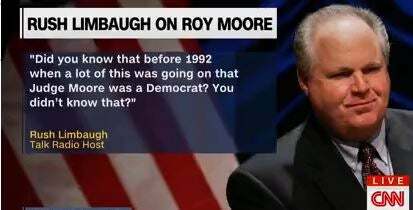 RUSH ARCHIVE: Did you know that before 1992 when a lot of this was going on that Judge Moore was a Democrat? You didn’t know that? How about all these people now? “Oh, yeah, yeah, everybody here knew about Judge Moore. Oh-ho-ho, yeah, good old boy, we’ve known about Judge Moore for a long –” while he was a Democrat. Nobody said a word when he supposedly was attracted to inappropriately aged girls, he was a Democrat. GENOVESE: …we now know that there – there’s no more to say. RUSH: Why are these people so upset? This is just one instance. I mean, this is all over TheHill.com today. I mean, it’s in a Drive-By Media locations. What about this has ’em all so bugabooed? If it’s such an asinine comment and if it’s a defense, why spend so much time on it? A, it wasn’t a defense. There hasn’t been any defense. But I’ll tell you what’s going on. If you take a look — we mentioned this yesterday, too — have you noticed, ladies and gentlemen, that well over 90, maybe 95% of all of these men that have been accused of all of this perverted behavior are Democrats and liberals in good standing? And the stories continue to pop up every day. There is more and more information being released about additional guys, some of them in universities, now some in the United States Congress, Hollywood, of course, hedge funds, Big Business. It’s stunning how much of this behavior is tied to Democrats. And so I came along innocently in the third hour of the program said, “Do you know this Moore guy used to be a Democrat back when all this –” And the defense league jumps into gear and immediately has to somehow swat this down, when it was a mere observation. Something tells me that there’s a lot of people wound very tight, or tightly, out there, because this story — I’ll tell you, it is incredible when you sit back and simply recall — every day it seems there is a new story involving inappropriate behave towards women by guys who are liberals or who are Democrats or obviously who are both. I’ve got three different stories today on Bill Clinton and how it’s time that we — they are the Drive-Bys — it’s time we stop giving Bill Clinton a pass. And everybody’s got the wrong idea about what’s happening with this. This is not about coming clean and owning up all of this 20/20 hindsight on Bill Clinton. It’s not about that at all. This is about people who are trying to save face. These are people who, throughout the nineties, defended Bill Clinton. And not only defended Bill Clinton, but attacked the women who came forward. They gave him a pass, and they’re writing today about how that was a mistake. And they’re doing that for two reasons. A, to save face, and then to supposedly inoculate them from charges of hypocrisy or irony by now going after anybody they can find on the Republican side who may be guilty of this kind of behavior. Because, after all, if they’re gonna open up and start firing all barrels on any instance of conservative or Republican men alleged to have behaved this way, the elephant in the room is Bill Clinton out there and his pass that they all gave him, so they’ve gotta get that out of the way. So they now have to go back in time, back to the mid-nineties and admit their mistakes and say that they gave him a pass and shouldn’t have and maybe even acknowledge that giving Clinton a pass sent a signal to Hollywood men and others. I mean, if Nina Burleigh from TIME magazine’s out there and is saying “Mr. Clinton, I would give you a Lewinsky as a thank you for keeping abortion legal,” well, if you’re a Hollywood actor, and your purpose in life is to get as many women bedded as you can, you learn the lesson very fast: Come out, become the biggest publicly pro-choice guy you can, and women will appreciate it and love you, and that’s half the battle. And there’s no question that giving Clinton a pass sent a signal to a bunch of other people, “Hey, if the big dog is gonna get away with it, not only get away with it, if Clinton’s gonna get away with it and be heralded, if Clinton is gonna get away with it and be held up as a star, if Clinton is gonna get away with it and be allowed to remain the big dog in the Democrat Party, then what possibly could happen to me?” I don’t doubt that Clinton being given a pass by everybody — women and men in the media and in Hollywood — contributed to the instances and occurrences of this behavior by other liberal Democrat men. So now enter Judge Moore, and they want to destroy Judge Moore, and they want to take him out for a host of reasons, chief among them I don’t believe is his alleged behavior. I think they want to get rid of Roy Moore because we just can’t allow somebody to get elected to the U.S. Congress who doesn’t think like everybody else in the U.S. Congress does. We can’t have that. We can’t have all this oddball, weird thinking. We need to keep electing people that are gonna come here and not really change anything. It’s why they’re trying to get rid of Trump. He is the quintessential outsider, and they simply can’t allow that, they can’t accept it, they can’t tolerate it, and they can’t make it look like they’re okay with it. So they have to spend however many years that Trump is president, that’s how many years they’re gonna spend trying to disqualify him, trying to impugn and insult and hopefully get rid of him. It’s all about insider versus outsider, establishment versus outsider, and that’s what it is with Judge Moore. Judge Moore thinks entirely differently than anybody else in the swamp. And of course the swamp doesn’t want any changes to the swamp, and the best way to make sure that happens, don’t let anybody that thinks differently get in the swamp. You have the added benefit with Judge Moore that he apparently has these oddball behavioral patterns, kind of like Joe Biden has — ahem — toward young women — ahem. Excuse me. Wait ’til they hear that. And they’ve gotta unload on Judge Moore. I mean, conservatives, liberals, Democrats, Republicans have to unload on Judge Moore. Why suddenly, Jeff, old buddy, old pal? Why is Clinton’s sexual misconduct suddenly morally indefensible? Because it was always totally and completely indefensible. It must work into your playbook to suddenly be outraged by this lifetime of abuse of women by Bill Clinton. And, by the way, there is still a person who is co-elephant in the room who so far has gotten a pass. Because it’s not Bill Clinton. It is “the” Clintons. Not only did Bill Clinton do the deeds. Not only was Bill Clinton riding dirty in the mortal words of the Reverend Jeremiah Wright, pastor of the Barack Obama church, not only was Bill riding dirty, Hillary was riding shotgun. Hillary was destroying and helping to destroy any of the women who had been ridden dirty who were coming forth to say so. And so far we haven’t had any news stories from guilty leftists suggesting that it’s time we stop giving Hillary a pass in the defense of her husband’s mistreatment of these women. Why does Hillary continue to get a pass but now we’re in the process, the left is in the process of throwing the big dog overboard? You realize everything Clinton has done since they left the White House and stole some furniture out of there on their way out, you remember that happened? Ever since then, the Clinton Global Initiative, the Clinton Crime Family Foundation, the disaster relief charity works, all the numerous trips to Haiti, all that’s been about has been to rebuild the Clinton legacy that has been tarnished by the Monica Lewinsky story and other ancillary related stories involving other women. Everything the Clintons have done has been oriented toward erasing those memories and establishing a new legacy so as to facilitate Mrs. Clinton’s further presidential aspirations. And now she has bombed twice. And they don’t want her to be the face of the party any longer, so they’re doing whatever they can to clear the decks to be able to go out and destroy any Republican they find, ’cause right now the ratio in guys accused of sexual harassment, what is it, about a 50 to one Democrats to Republicans? 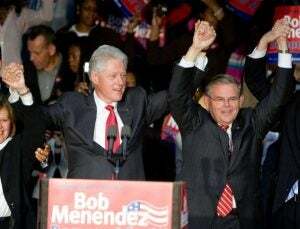 Whenever there is a Republican that pops up on the radar who is accused of this, the Drive-Bys have to be able to go after whoever that is and destroy them, and they think giving Clinton a pass provides a problem. So in hindsight now they’re trying to save face and admit their guilt and their mistakes in giving Clinton a pass. And now they’re fixing it. But you notice how the fix goes. “We are taking care of our mistakes we made in giving Bill Clinton a pass so that we can focus on Donald Trump.” That’s what all of this ultimately is aimed at. RUSH: There’s Darrell in Effingham, Illinois, as we head back to the phones. Great to have you, sir. How you doing? CALLER: Mr. Limbaugh, it’s an honor, sir. Couple of real quick points. I’m retired military so I took another job and I travel from the left to the right to the north to the south coast and everywhere in between. I was down in Alabama and I had no desire to listen to the big football game going on the other night, so I was channel surfing. And it didn’t matter what genre of music you were listening to, be it country, rock ‘n’ roll, rap, it didn’t matter, all the radio announcers had the same thing to say and I heard this over and over again, and it struck me, they said, “As soon as Judge Moore won the primary over Mr. Strange” — get ready; here it comes — “they knew it was gonna get ugly. They knew.” One of the guys said the fertilizer was gonna hit the ventilator. The people of Alabama, this is no big surprise to them. RUSH: No. In fact, the two most recent polls that we have out of Alabama show Judge Moore up in both polls. In one poll he’s up six points. In another poll he’s up 10. And these are likely voters. RUSH: This may be creating a backlash. One of the things that is incumbent in these attacks on Moore is his voters are being attacked. The guy won the primary and so the people that made that happen are also being attacked right along with him, not by name, but as everybody goes after Judge Moore as an idiot and a pervert and whatever, well, his voters are realizing, hey, they’re saying that about us too. RUSH: He wasn’t a judge. CALLER: — to go on a date. RUSH: He wasn’t a judge then. He didn’t become a judge until 1994 after he left the Democrat Party. He was a Democrat back then. Ahem. RUSH: He became a judge. RUSH: No. We don’t want to talking about swallowing here, but, I tell you what. The business about a phone, they said that it was a cell phone that he was calling on? I haven’t seen that so I don’t know.